The best part of a wedding is debatable for many, be it time spent with family, eating great food, or scoping out the latest in wedding fashion. For some, there is no question – the dancing is the best part! 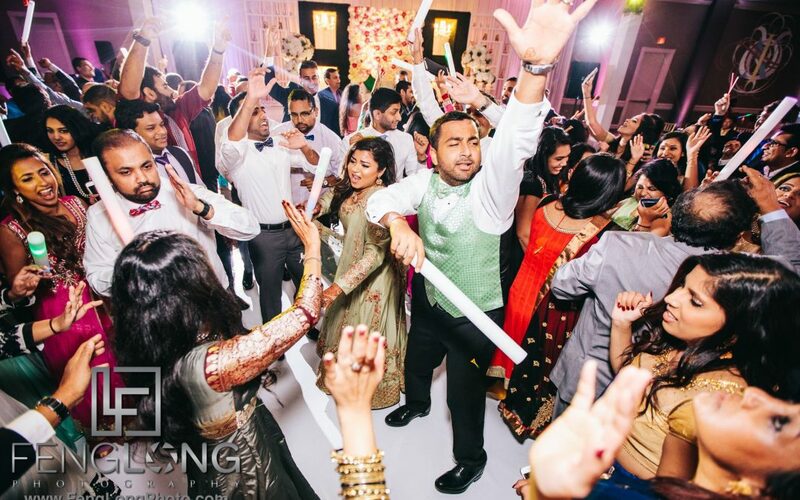 In South Asian weddings, music, like food, plays a big role during the events. Whether to create a celebratory mood at the mendhi/sangeet or to strike a somber tone at the vidai, music helps to express how the crowd feels at any given moment. The best DJs know how to read a crowd and play to their feelings. A crowded mob on dance floor at the reception? Thank your all-knowing DJ for that! Selecting an entertainment vendor is much more than just music. 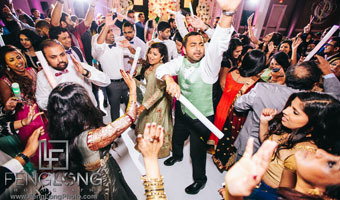 Most modern South Asian weddings include family/friend and bride/groom performances as well as videos, slideshows, and unique couple entrances. With receptions now resembling mini-musical productions, choosing an entertainment provider you are comfortable working closely with is key. Many entertainment vendors now offer a range of services from dance floors, lighting, live entertainers, and emcee services, so carefully consider your specific needs when narrowing your list. Budget: This is something to consider for all your vendors, and the entertainment provider is no different. Consider the number of events for which you need a DJ and Emcee. Do you need special lighting for any events? A dance floor? Want special effects like monograms? Be sure to sure to consider all details when reaching out to potential vendors for a quote. Reputation: Experience is a key factor when selecting your DJ. There is nothing worse than an empty dance floor! Dudha explains that experience “should be the most important factor, not how long they have been DJing, but their experience with handling a crowd, and experience with the style of music required for each event.” Word of mouth referrals, references, and personally witnessing the DJ in action will give you a sense of their style and personality. Music: Check with your DJ on the available music collection. If you have a specific playlist in mind, the DJ will need to be sure all tracks are available. Also, ask that the music collection is current and includes wedding favorites. If you have a preference on whether guests can make song requests, check with the DJ on how he/she will handle the requests. Attention to detail goes beyond just the first meeting. Ask your entertainment vendor how they will communicate with you throughout the process. Will the DJ surprise you on your big day or will they reach out closer to your event to set a timeline and narrow selections? Dudha likes to reach out to clients one and half months before their event. “I help them with music selection, itinerary timeline, and understand their playlist. [This gives me time to] mash up a custom mix for the Bride and Groom’s reception entry.” Getting to know your entertainment vendor has advantages so they truly understand your style and needs for your events leaving you more time to enjoy your wedding day … and dance your feet off! The experts share the latest in music trends and what they’re listening to now (when they’re not catering to the requests of brides and grooms!). Dudha: There have been so many events with special moments, but it’s always amazing when you see the bride walk down the aisle. I realize that one day I will walk my own daughter down! Khan: My favorite weddings are mixed culture weddings … I must say nothing is more beautiful when two cultures mix. Every single moment of weddings are my favorite, but one in particular is when I get my bride and groom behind the booth and they DJ with me. Also, feeling a sense of togetherness from my crowd is the most uplifting feeling! Special thanks to the experts who contributed their advice for planning wedding entertainment. Rina Shah is the CEO and founder of The Arpan Group, a boutique ad agency and public relations firm that specializes in capturing untouched ethnic markets. From press releases and media kits to marketing materials and by-line articles, The Arpan Group customizes solutions based on the client’s needs. Based in the Bay area, The Arpan Group works with clients across the US. For more information, visit www.thearpangroup.com or call (703) 651-6670. Article appeared in the December 2017 issue of Desh-Videsh magazine. Rajesh Bhandari first discovered the lyrical beauty of Indian classical music at a young age on a trip to Delhi, India. 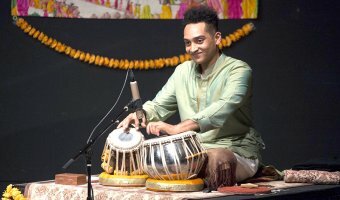 Bhandari and his father returned to the United States along with a harmonium and tabla beginning the young percussionist’s musical journey. 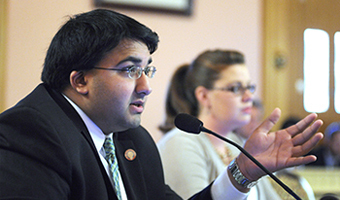 Born in Queens, New York, Bhandari now resides in Miami. Soon after the fateful trip to Delhi, Bhandari began studying tabla, music, and theory with Pt. Ravideen Ramsamooj. Over the years, Bhandari has studied with many great maestros including Pt. 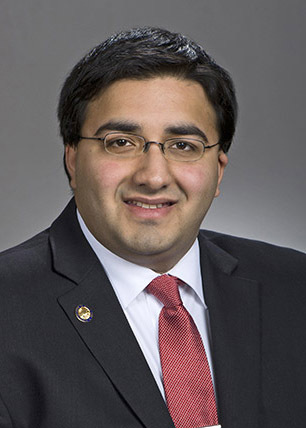 Samir Chatterjee, Pt. Anindo Chatterjee and Ustad Zakir Hussain. 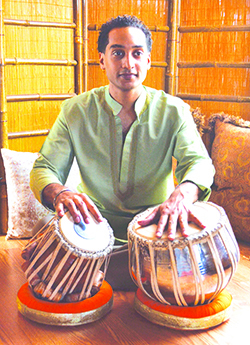 While he began his musical journey studying classical Indian music, Bhandari began exploring Western styles, including Jazz and World music, in his teens and during his college years at Miami Dade College (MDC). 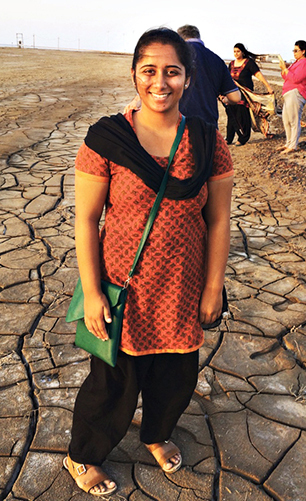 From Bollywood to Ghazal, Bengali and Punjabi geet to World music and Jazz, Bhandari enjoys learning and experimenting . 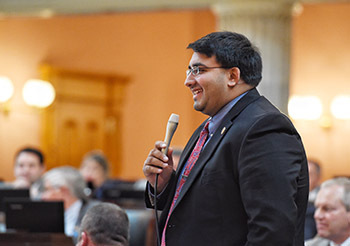 At the age of 14, Bhandari began performing and traveling, which was a unique learning experience. 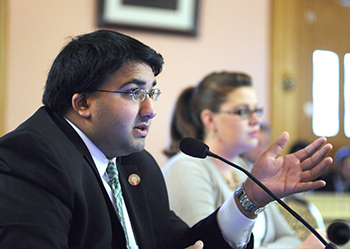 Early in his career, Bhandari was a dance accompanist at the New World School of the Arts in Miami. It was during this time that the young musician began to understand the relationship between dance and music. Feeling inspired, Bhandari began composing music for dances led by students, faculty, and visiting artists. Since that time, Bhandari has accompanied many dance artists and musicians from around the world, making him a truly versatile tabla player. Bhandari now shares his knowledge and experience with eager young musicians in South Florida, where he teaches classes monthly. Fans can expect his latest solo fusion album, Ambient Resonance, to be available in early September, followed by tour dates in the fall. Featuring great musicians from a range of genres, the album will showcase Bhandari’s talent and love for music in all its forms. Bhandari will also be performing with Vocalist Sudhir Narain, who will perform bhajans and geet, on Saturday, August 12, 2017, from 6-9pm at the Palm Beach Hindu Mandir. For more information about Rajesh Bhandari, visit https://www.rajbtabla.com/. You’ve had the opportunity to learn from and work with accomplished musicians, such as Ustad Zakir Hussain, Pt. Krishna Mohan Bhatt, Lakshmi Shankar, Falu Shah, and even Shakira. Is there any one moment that stands out as the most memorable? Studying and performing Ustad Zakir Hussain’s music at Carnegie Hall in 2009 was definitely the highlight of my career. It was also an amazing experience working with Pt. Shivkumar Sharma, Kala Ramnath and drummer Steve Smith in that workshop and performance as well. And there are so many more amazing memories for me, from performing with Smt. Lakshmi Shankar on WLRN in 2003 to performing with Questlove to touring with Shakira in 2009 and more recently with Utsav Lal, Mitali Banerjee Bhawmik, and Suresh Wadkar. Why tabla, what drew you to this particular instrument? What are some of your earliest memories of learning to play?I think I was just fascinated with the sounds that one can make with this instrument, but I also fell in love with classical music’s rich nuanced melodies and deep rhythms. I remember from a young age a strong desire to practice and play tabla, and still to this day am in awe of what great music you can create. Who do you consider to be a mentor and why?I would say I have a few mentors but Ud. Zakir Hussain has had the biggest influence on me, especially due to his work in fusion and world music. He really showed me how many possibilities there are for tabla in traditional Indian music as well as other genres. He also showed many artists how to be better stage performers as well as how to be more inclusive when it comes to classical music. He taught me how it is important to learn about the cultures of the world through music. Pt. Samir Chatterjee and Pt. Anindo Chatterjee are also big influences as well not only musically speaking, but they were both mentors on how to remain focused on practice and maintain virtues of humility, patience and perseverance. What advice do you have for young Indian Americans who wish to pursue a career in music or the performing arts?The performing arts as a career isn’t the easiest path, but it can be quite rewarding. I do think there are more people now who are choosing to put a good effort forth as well. I believe it’s important to know your intent with your art first, then continue being consistent with developing your ideas and finding a way for people to experience it. Patience and humility is needed for this as well. But as long as you are genuine in your approach, you can find an audience and people are interested in having new experiences and the performing arts is a great way to connect with people on a very deep level. As the arts are a means for one’s expression of some of the deepest human emotions and can have a profound effect on those who can bear witness to it. All images provided by Rajesh Bhandari. Article appears in the August 2017 issue of Desh-Videsh magazine. 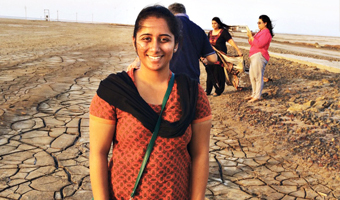 As a young child, Mona Ahuja listened to her mom tell magical stories about the Moon. Through those tales, Ahuja began to understand the importance of the Moon in Indian culture and folklore, an understanding she has since passed along to her three boys. 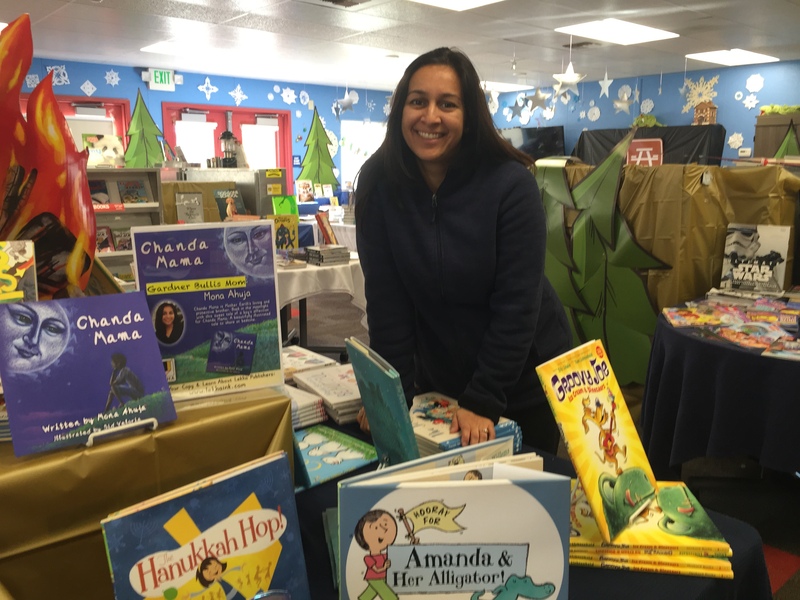 Her love for storytelling and the vibrant imaginations of children led to Ahuja pursuing a career in writing. 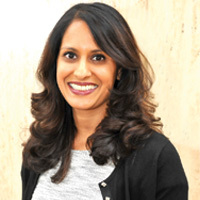 Born in Los Angeles, California, and raised in the Bay Area, Ahuja first began her career in, at the time, the new industry of Internet Security. 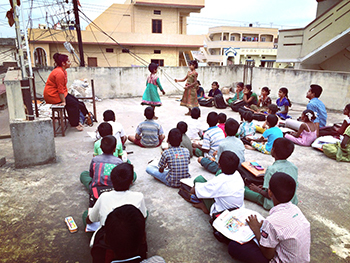 While the work was exciting and new, Ahuja soon chose to pursue her passion of working with children and instead began teaching dance to little ones. Her ability to connect and engage with youth has been much more fulfilling, and the experience even inspired her to explore her creative side. In doing so, Ahuja developed some of her ideas and began writing stories as a way to not only connect with children, but also continue the tradition of storytelling and the sharing of cultural folklore. Chanda Mama is the perfect bedtime story for families to enjoy together and represents Ahuja’s fascination with the moon, which began when she was young. She shares, “As a child, on road trips, I would spends hours staring up at the sky in wonder of the Moon and its connection and power over Earth.” From wondering whether a “Man on the Moon” truly existed to watching the moon rise, Ahuja’s love for the beauty of the moon shines through the pages of her new book. Her stories about the moon helped to soothe her young boys at bedtime, and later inspired her share these tales with other parents. 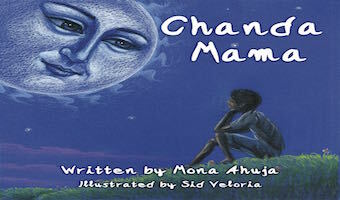 In Chanda Mama, readers join a young boy as he follows the moon in the night sky. The calming illustrations and gently-told story make Chanda Mama a much-needed addition to any family’s bedtime routine. My children are my greatest inspiration for writing and telling stories. Children, in general, have an amazing imagination and are extremely observant. They notice and question everything. I don’t always have the age-appropriate answer for them, so I tend to draw on my creative side and stretch the truth a bit. Some may not agree with this method, but I love to see where it takes them. Often they continue on with my initial ideas and add their own stories. It’s a wonderful way to see how their minds work. What are your thoughts on the diversity of books currently available in schools and public libraries? I don’t think that it is as diverse as it should be, but it is definitely more so than when I was growing up. I’m happy to see that and thankful that my kids will be exposed to our culture and heritage through these books. Picture books are an excellent way to introduce different cultures to young children. My own personal library consists of books from Thailand, Vietnam, Mexico, India, and many other countries. Stories about animals, the moon and sky gods, and fishing all captivate young audiences and reflect what is important to those cultures. Today, it’s more important than ever that our young children have that exposure and understanding starting at a young age. They need to understand that no matter where you come from, we, as humans, are all very similar in our need for connection, family, and love. 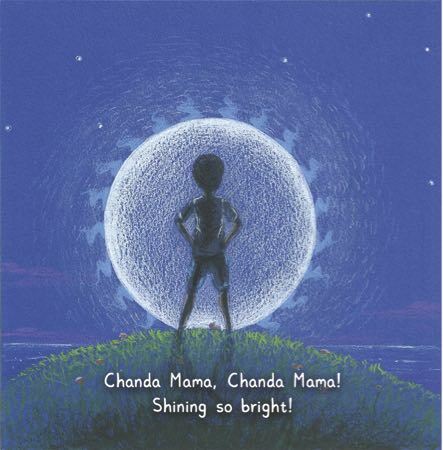 Bask in the moonlight with this sweet tale of a boy’s affection for Chanda Mama, Mother Earth’s loving and protecting brother. Just as a brother watches over his sister and her family, Indian folklore teaches that the Moon, known colloquially as Chanda Mama, watches over the Earth and the Earth’s children. This beautiful picture book continues the Indian tradition of love for the moon. This beautifully illustrated tale is the perfect reading for bedtime. Visit www.lekhaink.com for more information and to purchase your copy. Article appears in April 2017 issue of Desh-Videsh magazine. That moment where the silver lining on the wedding planning cloud has finally arrived – the “design wedding cake” item on your wedding-to-do list! The venue has been selected, and contracts have been signed. You have met with every wedding vendor possible from photographers to wedding planners and décor professionals to hair and makeup artists. You have never been more ready to move on to more delicious tasks – choosing and designing your dream wedding cake! Everyone in the wedding planning entourage is likely to get on board with this task. Couples may already have favorite flavors in mind and are looking to match the design with the overall theme for the wedding reception. Pinterest is a bride’s best friend during the wedding planning process, and even more so when it comes to designing the wedding cake. The challenge lies in finding the perfect design, while still ensuring the cake tastes delicious. A seemingly simple task is suddenly made more difficult, but at least tastings are involved! Budget: Your budget will impact how intricate the design of your cake as well as the number of tiers. Using fresh flowers vs. sugar flowers, Styrofoam layers, a sheet cake for serving, all of these are options for optimizing budget. Speak with your cake designer to determine the best way to achieve your dream vision without breaking your budget. Venue: Is the wedding reception outdoors or indoors? The temperature and serving time will influence the choice. Some frostings can withstand heat, whereas others need refrigeration. With the right details, your baker recommend flavor and frosting pairings accordingly. 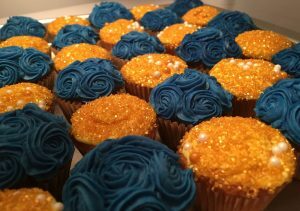 Guests: The guest count is crucial as many bakeries charge per serving. The number of guests will also help determine the number of tiers needed for your cake. Will other desserts be served leaving the cake to present the “wow” factor? In either case, your baker can suggest ways in which to maximize serving size and still amaze your guests. Coming to the tasting with the right people is just as important as bringing your appetite. Laljiani and Hasnain advise couples to “bring only the people who will have a final say in the decision regarding the cake design and flavors. While it may seem fun to have your bridal party, parents, and in-laws at your tasting, it can result in too many varying opinions and make the experience more daunting for the couple.” Staying true to what you as a couple enjoy will be important as you make the final decision. 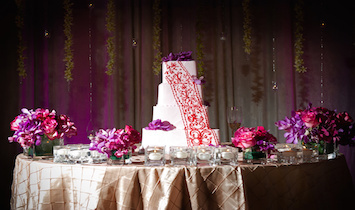 Though your guests should enjoy the cake, ultimately, the cake is one of many memories you will remember from that day. Can the baker accommodate dietary restrictions? Will the baker be preparing other wedding cakes the same day? Will the baker offer recommendations on the best to way serve? The experts share their thoughts on the perfect wedding cake. 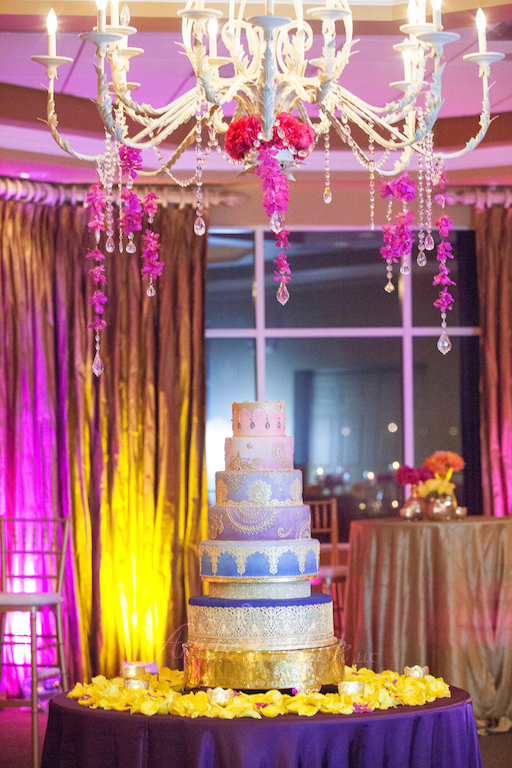 Jovana: My idea of the perfect cake is probably what I made for my own wedding! I particular like classic cakes, but with a twist. Something original that hasn’t been seen before, those are my favorites. As far as flavor goes, I enjoy cakes that are made from scratch while using all-natural ingredients. I can always tell the difference! 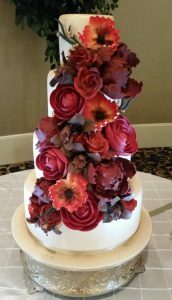 Mercedes: My cake preference is a simple, clean design with some height and a very marked focal point, such as a large bloom. I like muted shades with a touch of “bling” such as gold or silver. My flavor preferences are complete opposites because I always like to offer two flavors. The first would be a light Raspberry Lemonade combination, which is Lemon Chiffon cake with Raspberry and Cream Cheese fillings, and second would be Dark Chocolate cake with Salted Caramel and Chocolate Ganache fillings. Offering completely different flavors makes it more exciting! Zehra and Saba: We always enjoy a cake that is unique, exotic, and daring. The one we enjoyed creating most was our dragon cake, which was a coconut cake with a mango buttercream and mango, passion fruit, and basic reduction as a topping. This cake was the perfect blend of sweetness, tanginess, and spice and would be a wonderful choice for a bride who is looking for an exotic dessert. Special thanks to the experts who contributed their advice and tips for designing a wedding cake. Article appears in the September 2016 issue of Desh-Videsh.